The LGBT Resource Center (LGBTRC) (est. 2005) provides support, education, and advocacy for LGBT and Ally undergraduate and graduate students at the University of Southern California. LGBTRC works with diverse campus undergraduate, graduate and faculty/staff and alumni organizations along with campus departments to address the LGBT student experiences. 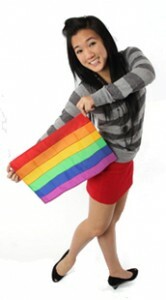 The LGBTRC maintains a multicultural framework with its programs and services to make certain the intersectionality of diversity issues among the LGBT identities are represented. LGBTRC also provides resources and referrals, such as information about neighboring LGBT support services, to all campus members. Support: LGBTRC participants will identify at least three campus resources that can assist with the development of a lesbian, gay, bisexual, transgender, questioning, queer and/or ally identity. Educate: LGBTRC participants will articulate a current political issue that affects the LGBT community. Advocate: LGBTRC participants will be provided the knowledge to take action and promote LGBT equality.